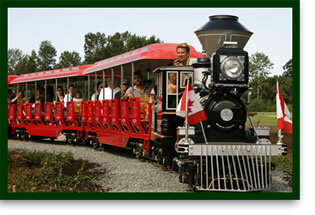 Ride over a mile of rails around our farm while learning all about our family farm. The 20 minute ride will take from the station by our roadside Farm Market, around the perimetre of our crop-producing fields and past Blenkinsop Creek, where you will learn more about our Creek Restoration Project. October Only. 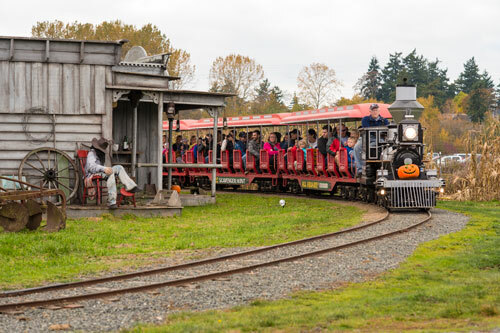 Six red passenger coaches, each seating 28 riders, are hauled by a beautiful scale replica engine of the C. P. Huntington, a 19th Century steam locomotive which worked around California in the 1800's. Certified Engineers guide your tour.